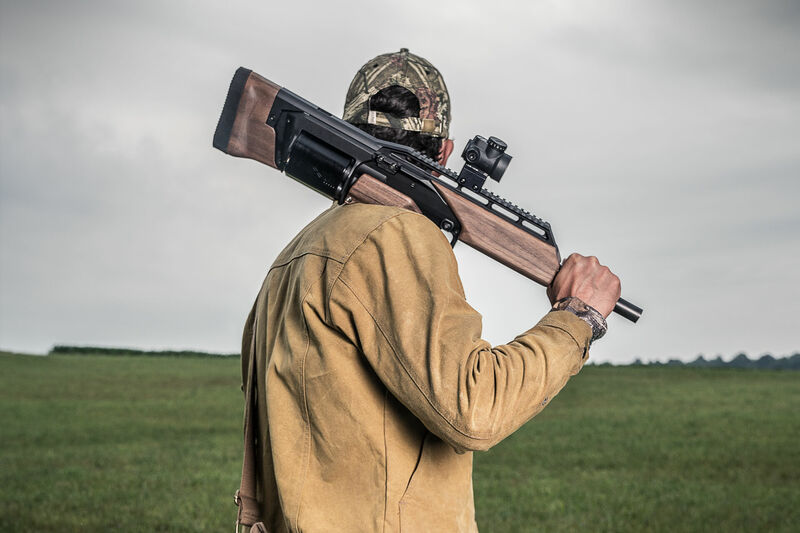 SIX12 Modular Shotgun | Crye Precision | SIX12™ is a 6-round, 12-gauge, cylinder-fed shotgun that can be mounted to most AR platforms. Be the first to know when the SIX12 becomes available. We are very pleased to introduce the SIX12TM;a compact, 6-round, cylinder-fed shotgun. The SIX12TM’s unique design puts the weight of the gun close to the shooter making it easy to carry and use. The SIX12TM is physically compact while still providing a full length barrel. This ideal scale makes the SIX12TM very easy to manage while hunting or at the range. The SIX12TM’s design is well suited for many recreational and defensive roles and it offers semiautomatic (double action) firing without relying on a finicky gas-system. The SIX12TM can fire 12ga rounds up to 3" in length. REMINDER: Obviously, firearms are inherently dangerous. Users are responsible for complying with federal and local laws. The SIX12TM’s unique design puts the weight of the gun close to the shooter making it easy to carry and use. Copyright ©2016 SIX12. All rights reserved. SIX12™ 2015. PAT. www.lwpatents.com Other patents pending.